Welcome to this month's Demonstrator training blog hop - if you've reached me from another blog then welcome - I'm Laura (AKA The Stamping Cat) a demonstrator from the UK - if you're starting with me then I'm happy to see you. I'd love for you take a look at my blog and then hop along to the next one in the list! For this month’s blog hop, I wanted to share with you the Valentine’s card I made for my lovely partner. Here in the UK, we do celebrate Valentine's Day, although not as much as our American friends. My partner and I don't do big celebrations, but we do exchange cards and a small gift. For this year's Valentine card, it was an easy decision on which stamp set to use. My partner has recently taken up fishing, and as soon as I saw the Best Catch stamp set I knew that was the one. I did however only buy the stamp set, not the co-ordinating dies (no idea why, silly decision!) but I figured I could fussy cut the fish after I'd stamped and coloured him in with various blend pens. For the background, I thought that Brusho would give the perfect watery background. I used watercolour cardstock as I wanted to add plenty of Brusho and water to get the perfect look. To make the card a little bit more romantic, I added some small hearts from the Nine Lives stamp set and some clear epoxy hearts. The sentiment was added and there you have it, a fishy Valentine card! Thanks for reading, I'd love for you to hop along to the next Demonstrator in the list to see their creations. Don't forget, all products used are available to buy in my online store. 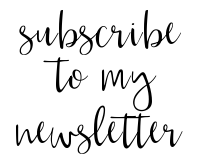 You can also enter your email at the bottom of this post to make sure you never miss a blog post from me. A great masculine card. Thanks for sharing! You've coloured that fish beautifully! Great background using the Brusho's, your blend colouring is fantastic!!! Lovely, I have never tried brusho..
A great masculine card, I find they are so hard to create. Love the brusho background. Oh wow! Love the brusho with the colorful fish.